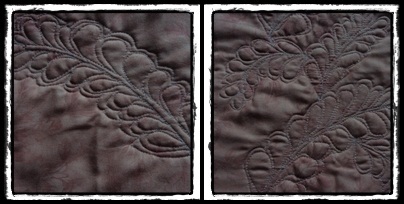 This is my attempt at this months FMQ challenge over at SewCalGal. The Echo Feather Plume with Diane Gaudynski. This was certainly a challenge and I know I will have to practise this one a lot before I am totally happy with it. 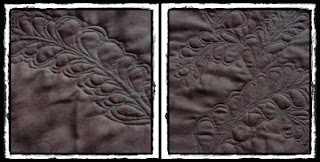 I would like to try it on a small project b4 I attempt to quilt a large item with this. If you would like to see how I used the January challenge go to my previous post here.